Microsoft has dreamed up a new kind of desktop PC, in which swapping out components doesn’t require technical know-how or comfort around circuit boards. 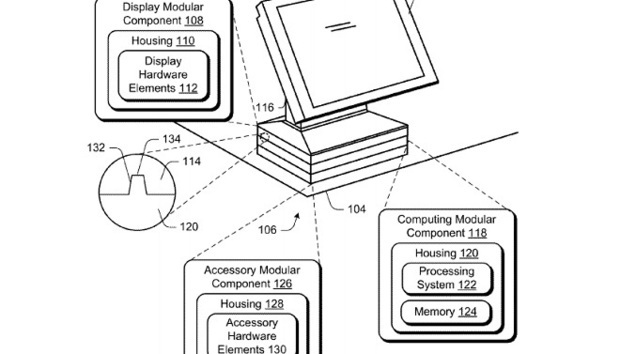 The modular PC concept appeared in a Microsoft patent application, filed last July and published last week, VentureBeat reports. The patent calls for a stack of hardware modules that sit underneath the display, which itself is also replaceable. When you want a new processor, battery, graphics card, or speakers, for instance, you just swap out the old module and add a new one to the stack. The modules could also add new capabilities to a PC over time, including gesture recognition or holographic projection. Each module would have its own housing, with magnetic connectors for easy replacement. While the idea is clever, other companies have pursued similar visions before, and haven’t gotten very far. In 2014, Razer introduced a modular PC concept codenamed Project Christine, but it never left the concept stage. A newer effort called the Micro Lego Computer has yet to launch after a mid-2015 announcement. Meanwhile, Acer has started selling the core unit of its Revo Build stackable PC, but none of the promised additional components. The problem with a fully-modular PC system is that it’s impractical without standardized industry support. Unless a wide range of component makers pledge long-term commitments to a modular system, anyone who buys in would likely pay higher prices for a limited range of products, and would have less control over the hardware than they would by building a PC in the usual way. Microsoft’s interest in the concept is somewhat encouraging, as the company is powerful enough to hold sway over PC vendors and component makers. If Microsoft were to ensure support for swappable modules in Windows, and maybe offer some of its own, other hardware vendors might be compelled to get on board. But as with any patent filing, the mere existence of Microsoft’s modular PC patent doesn’t mean a real product is in the making. And it doesn’t even begin to solve the significant problems facing the modular PC concept as a whole.